(CNN) -- Chalk another record to the United Arab Emirates' collection. 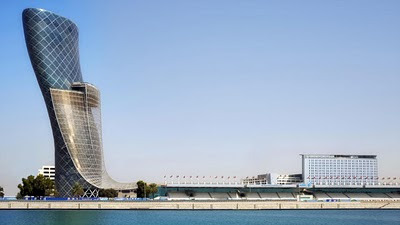 The Capital Gate building in the desert kingdom's capital, Abu Dhabi, has been certified by Guinness World Records as the "World's Furthest Leaning Man-made Tower." How far does it lean? Nearly five times farther than the Leaning Tower of Pisa in Italy. The 35-story Abu Dhabi building has an 18-degree slope, compared with four degrees for the freestanding bell tower. But unlike the tower in Pisa, the Capital Gate building has been deliberately engineered to slant. The floor plates are stacked vertically up to the 12th floor, after which they are staggered over each other by between 300 mm to 1,400 mm -- giving the tower its lean, the owners said. "It is a signature building which speaks to the foresight of the emirate," said Sheikh Sultan Bin Tahnoon al Nahyan, the chairman of the building's owner, Abu Dhabi National Exhibitions Company. The mixed-use building will be ready for occupancy at the end of the year. It is featured in a new National Geographic documentary, called "Megastructures." In January, Dubai -- one of seven emirates that make up the UAE -- unveiled the world's tallest skyscraper: the $1.5 billion, 160-story Burj Khalifa, which has a height of more than 800 meters (2,625 ft). Yes, I’d say Abu Dhabi is a safe place. Of course you will hear about some crime episodes from time to time and you should look after yourself as you would anywhere else in the world, but it is a safe place.